Barware was my solution … it all started with a Hurricane (signature cocktail of New Orleans) glass! I borrowed the beads and masks from my friend that is throwing the Mardi Gras party. I know that wines are supposed to be served in certain glasses … don’t think that the same rules apply to gumballs! Yes, I’ll pour you a tall glass of chocolate balls (wrapped in pretty colored foil)! There’s nothing like a good old-fashioned break-a-part especially when it’s Key Lime flavored (Louisiana and Florida are almost neighbors)! OK … we have all heard of shots of alcohol, Jello shots, even shots of frosting … I ask why not Sixlets shots? Small shot glass make excellent small servings! The bottle is some random one that I saved, probably from salad dressing. 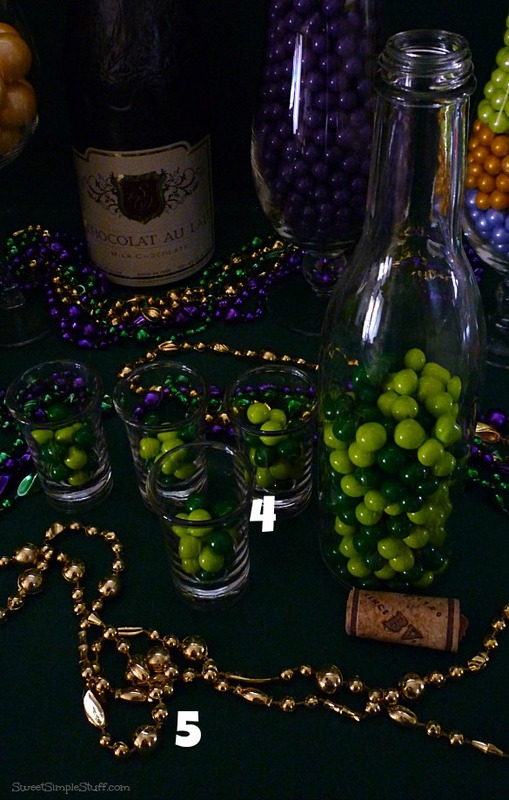 Beads, beads, beads … it’s all about the beads! Masks are everywhere … not sure why … maybe people want to stay anonymous? Milk Chocolate Wine/Champagne bottle … it’s always a good year for chocolate! Hurricane glasses filled with more Sixlets … never enough chocolate! I hope you enjoyed my first Candy Buffet! Thank you to SweetWorks for the candy! 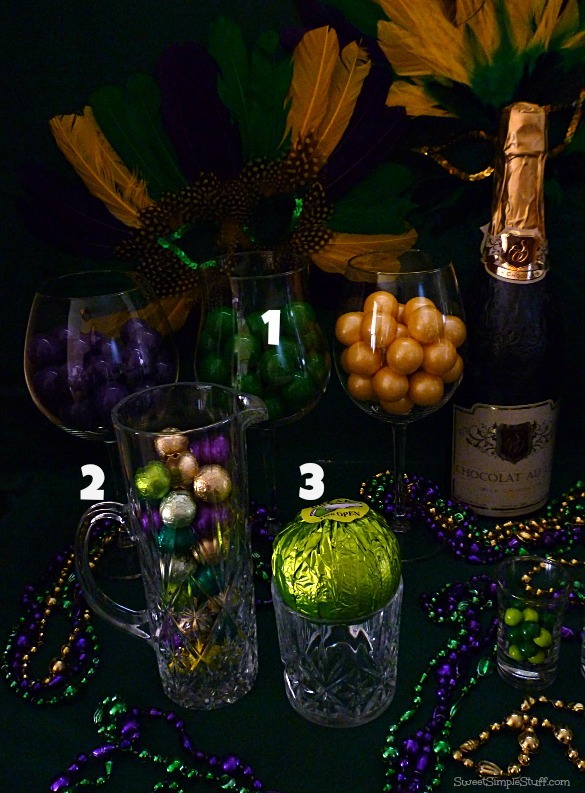 Have you been to Mardi Gras? 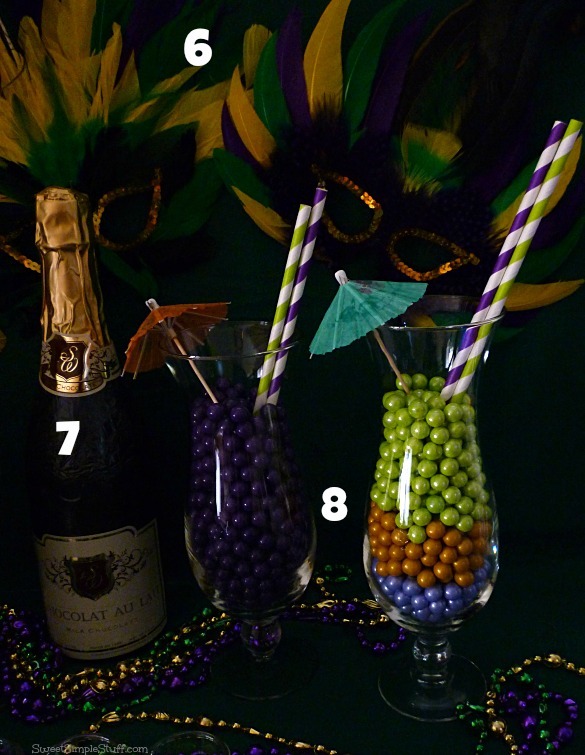 Your candy buffet is perfect for Mardi Gras. Shots of Sixlets are my kind of shots! Bring ’em on. Have fun at your party. 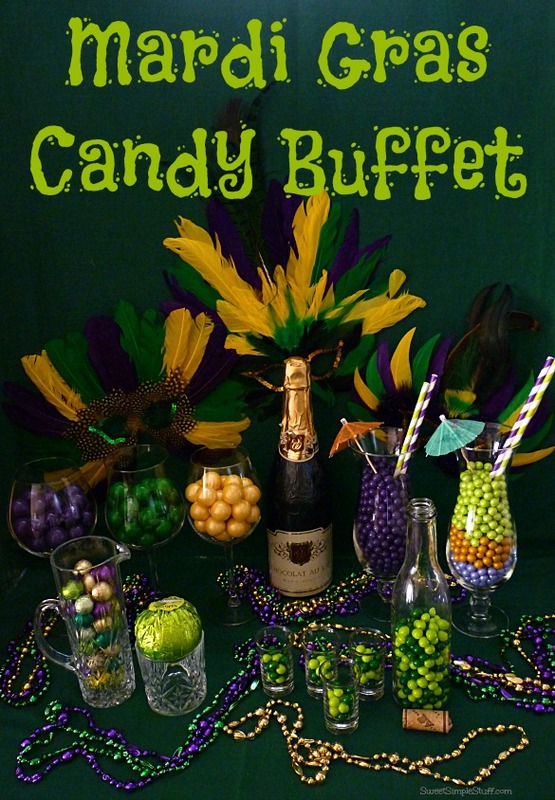 This is Anna from Tulsa,Oklahoma and I love you Mardi Gras Candy Buffet set up. I like your Milk Chocolate Wine/Champagne bottle.Also the different Glasses. Every thing is so cool. Thank you for sharing with us. Thank you Anna from Tulsa 🙂 I’m ready to break open the chocolate bottle … don’t have to wait until 5 o’clock, right? Hi Dee in Texas 🙂 I never knew that … thank you for sharing! Originally lived close to you and now live in TN. Love the Mardi Gras theme. Thank you Carolyn in Tennessee 🙂 We may live close again … if the hubby gets his way! Very fun and so bright and colorful! Thank you Colleen in Texas 🙂 I’m not a big party person either … unless chocolate is involved, LOL! Thank you Lisa 😉 That’s a great idea for the masks, LOL!